The exhibition sets out to expand on the relationship humans have with plants, the environment, and their ecology. Reflecting on the show, set in Australia’s naturally beautiful city of Sydney, thanks to the city’ vast environment and the vast array of plants, trees and landscapes. The artists use photography in their practice, but also their experience with the ecology for “Plant + Human” to explore the human condition and how we respond to aspects of life through our relation to the botanical. 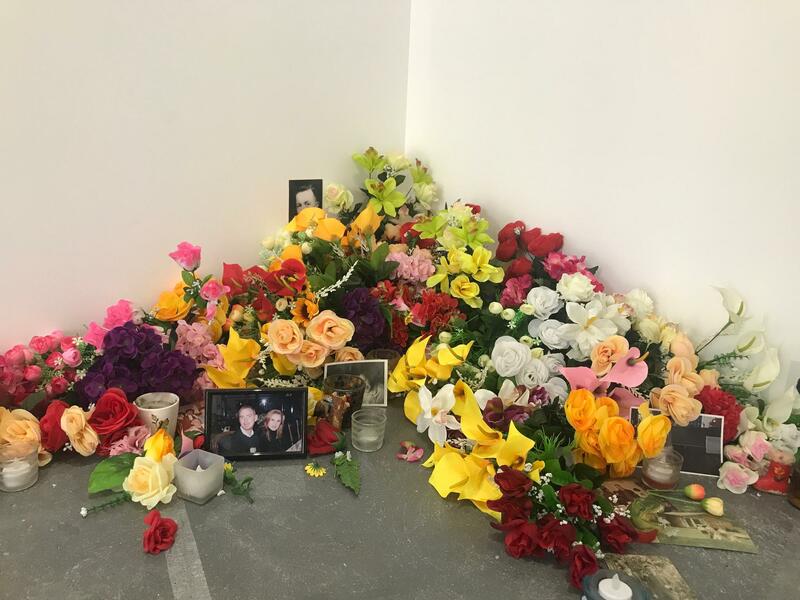 The most dazzling artwork in the exhibition appears in the form of a roadside memorial in Steven Cavanagh's installation, Kittens and Sunsets (2016), with a placing of heaps of flowers, tumbling from the corner, all bright and colourful. The two-part installation in the room is dotted with memorials with personal objects. Photographs, candles, and a home video of unknown people living their mundane lives, playing on an iPad, sets up the intimate space, growing out of the fake lilies, sunflowers, roses, and tulips. Life, death, beauty and abundance play off each other in the beautiful memorial, and the audience is invited to join in remembering. The thought-provoking work from Gunditjmara artist, Hayley Millar-Baker with photography that engages the ecology of the environment from an Indigenous perceptive, one that goes beyond the literal embodiment of connection to country; but also, the narratives and labels from the colonisers of Australia. 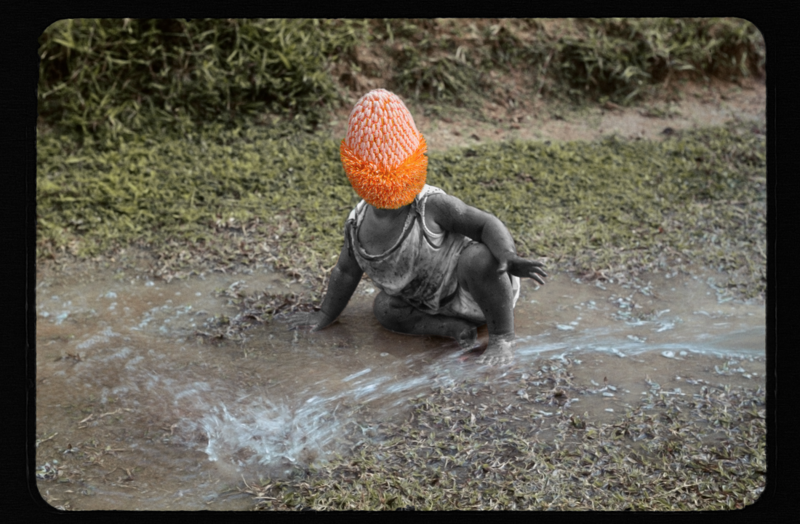 In Untitled #1 (2016), from the “Flora & Fauna” series, we see a black-and-white image of a baby, crouching in a stream of running water, set amongst an ambiguous forest setting; creating the contrasting imagery is Millar-Baker’s digital manipulation of the photograph. By placing a bright orange Banksia, a flower with follicles that remain closed until opened by bushfire, over the top of the baby’s head. A cloud of animosity, in the form of a bush flower that flourishes in intense pressure and heat, hides the child’s identity. Who the child is, or what she represents, is left to the viewer to fill in the gaps from the wall text next to the piece. Untitled #1 remembers the 1967 Australian Referendum which, for the first time in colonial history, included Aboriginal people in the Australian Census; for the first time counted those as citizens of the country they have inhabited for 70,000 years. The artist uses her practice to reflect on her own family, her mother and grandmother, who born only as part of the “Flora and Fauna.” Millar-Baker’s consideration of this part of history ties the irrevocably deep links humans have had to the land, but also the dehumanising categorisation colonisation brought to the country the exhibition is placed upon. Australia has a deep, and disturbing history, and contemporary artists are dismantling the lens to view history. Pony Express also engage the “Plant + Human” theme with performance, video, and installation. The artists use ecosex, the theory of plants and nature participating in human desires. In Glorious (2019) Pony Express bring a glory hole, such as the ones in gay bars and public toilets, to expose and reveal. The artwork consists of a hole cut out of the wall to peek in and spy on a video of blurring colours, green, purple, and bodies moving in and out of time with the nature captured. Consent is at play as you are allowed to view as much that is divulging, to “witness a fantastical transgression of the plant/human binary.” The artwork reduces the audience to consider their relationship with the environment, for the sustainability of the earth, but also how we engage with our community, thanks to the homophobia that was subjected onto the visitors of glory holes. There also is a consideration of the relationship we have to each other, that reflects into the treatment of the environment, as climate change hovers, looming over our heads. “Plant + Human” invites the audience to consider not only our relationship with the environment but also with ourselves and the humans we live among. It’s not always easy to detach yourself from the digital, and in Darlinghurst, near a busy and bustling city, contemporary art exhibitions can serve as reminders to engage and reflection on what’s around us, our histories, and our nature. We are responsible for the future state of our ecologies, but also our connection to each other.